This little sampler is dedicated to the 1st Anniversary of Sept. 11th and it is realized with shades of blue, silver and light brown. Blue and silver are heavenly colors, while brown is the color of earth. There is a space for your initials or for the name of a relative or a friend lost on September 11th. 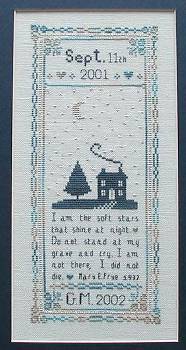 Stitches Cross Stitch, Backstitch, Satin Stitch, Eyelet Stitch.